Jerking venison is a method of treating deer meat by drying it on racks. Salt and other flavorings can be applied to assist in drying and preserving the meat and to add to its flavor. Once the venison is cut into strips and hung on a rack, it can be allowed to air dry, especially if it has been treated with salt and herbs. However, it is faster and it adds more flavor to place the racked meat over or near a fire so that the heat and the smoke from the fire facilitate the drying process and also imbue the meat with a smoky flavor. 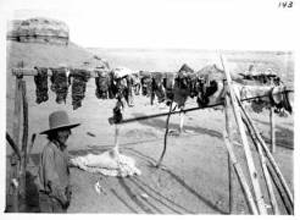 "Red meat drying at Ah Tso Lige, Red Lake, Arizona, date unknown," photographer unknown. Palace of the Governors Photo Archive (188516), New Mexico History Museum, Santa Fe.